So my buddies brother has a RC51 track bike that he dumped twice last year and it needs exhaust,air intake snorkel, gas tank (hole in it) and I think a new set of rearsets. Other than that it is fully set up as a track bike. What would you pay? Hes been asking me to buy it cuz he knows I love the V-twin bikes. I think hes getting desperate to sell as its not a very popular race bike in CCS due to its weight and parts are expensive. What would you pay? Am I insulting him at $500? It is a salvage bike to start with, and it needs work just to put it back on the track so keep that in mind. My buddy races a ZX6R from Farrell Performance and he really wants me to go racing with him. I have never had a bike on the track before, but would love to do it, but my Hawk is way to nice to push that hard on the track and take the chance of messing it up. Thoughts? Buy it for a parts bike and part it out? Last edited by insulinboy; 01-28-2014 at 05:41 PM. I have two RC-51s and a track RC.. an a few Superhawks.. And to be honest.. It would be insulting. And yes you will get opinions.. The engine is designed for the track, so you want hurt it there.... I would offer $1000- $1500.. to be fair with your friend..
Now the truth... The pig(fat, and brute) is not the fastest, or even the best handling (right out of the box). Yet it has potential..
With the same up-grades, as you will read on this forum to the superhawk. Front fork internals , rear shock, that is about the start. (of the up-grades)..
As HONDA produces production bikes to be decent streetbikes. The RC-51 owners, ( YES, me too.) are a cult following. 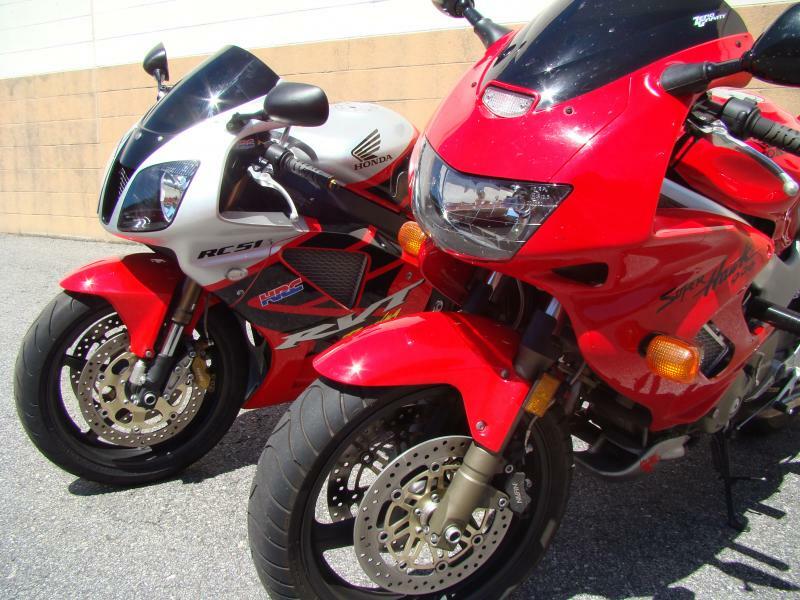 Once you own the bike, you will compare it to newer, more advanced bikes. And will probably sale it, or part it out...As so many do.. But you will want another RC-51... As a Large Group of members, come to Admit on other forums. (Speedzilla, RC-51forum.). Last edited by 1971allchaos; 01-28-2014 at 05:49 PM. Yeah I have a hard on for an RC as well! What year is the RC-51, last six digits of the VIN#.?? IMHO, i really think you cant go wrong paying even $1500 for it, let alone a grand or less. all i have to say is id JUMP on it. weather u slowly turn it into a fully working track bike as you have extra money, or part it out. i just did the full RC51 front end swap onto my SHawk, and i paid $750 for the forks, wheel, axel, upper and lower triples, calipers, rotors, clip ons, fender, bearings, hardware, etc.... and that was a pretty good deal IMO. you could even take the RC front end and put it on your SHawk for a HUGE upgrade to stock setup and then part everything else. or part all of it. or turn it back into working bike. My point is you have lots of options if u get it for a good price. That is one of the points I was attempting to point out.. With asking the year of the RC-51..
"IF" the bike is a """SP-1"" the the complete front end could be used in a SWAP.. Yet the SP-2 front forks are the more desired RC-51 forks. The bike in question is a 2003. Money should never come between friends and if you're even thinking about whether it might insult him then you should even offer IMO. Your correct there. We talked about the bike a little and all the work it needs to put it back on the track and he is firm at $1800. Heres a list of what it needs to be track worthy.